Janome Easy-to-Use Basic Sewing Machine with 12 Stitches including 1 Four-Step Buttonhole Easy Threading with automatic tension, All Metal Hook, All Metal Bobbin Case, All metal Shuttle, Cast Aluminum Frame, Diamond Cut Feed Dogs System, Adjustable Stitch Length and ZigZag Width with All Metal Zig Zag Presser Foot. 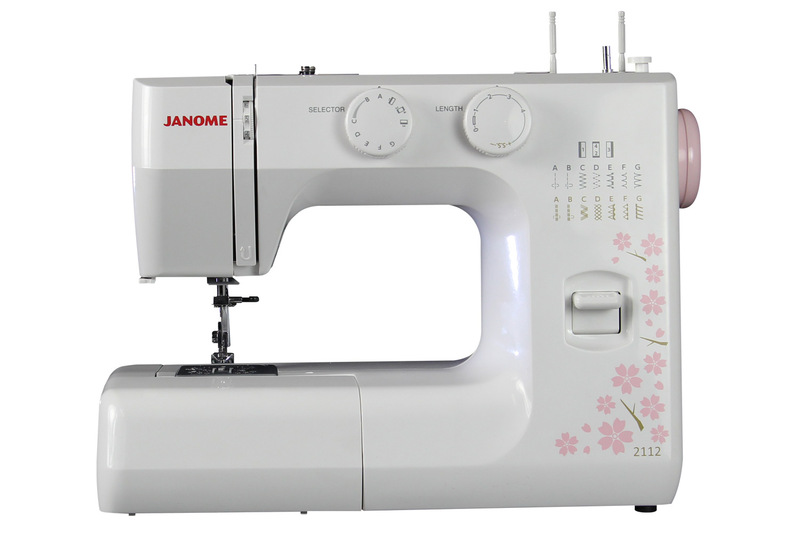 Janome 2112 Cherry Blossom is for people who want a high quality Very Easy-to-Use Sewing Machine. Simply Lower the feed dogs for free motion sewing and quilting with just the switch of a lever. You can use use the drop feed feature when darning and Thread painting. Adjustable Stitch Length & ZigZag Width Simply turn the length and zigag width dial and adjust the stitch to the appropriate settings for your stitch type. Heavy Duty All Metal Interior Aluminum Frame The metal interior frame ensures skip-free sewing and overall durability Janome Quality gives you peace of mind. Removable Free Arm & Accessory Storage The removable storage compartment turns this machine into a free arm. It is great for sewing small openings like a sleeve or hemming a pair of pants. 110-volt machine. Elna 5300Q Sewing and Quilting Model - Demo Floor model.